Willie Walsh: "This is by far the biggest crisis the industry has ever faced"
LONDON, England (CNN) -- British Airways posted the airline's worst annual loss since its privatization in 1987 as its chief executive declared there were "absolutely no signs of recovery" in the industry. 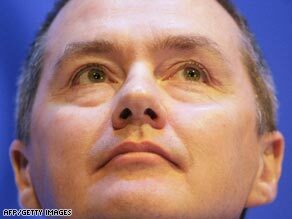 BA CEO Willie Walsh says he's never seen conditions in the airline industry so bleak. The airline slumped from profit to loss in the last financial year. During the year ended March 31, its operating loss swelled to £220 million ($348 million) from a restated profit of £878 million ($1.4 billion) in 2008. Demand for the airline's passenger seats and cargo holds fell during the last financial year, while its fuel bill rocketed to almost £3 billion ($4.7 billion). "None whatsoever, and that's across the board," he said. "In all of the markets we're operating in we see no evidence of recovery at this stage. I think there's some evidence of it bottoming out in some markets but absolutely no signs of recovery at this point." Like its premium-class competitors, British Airways is losing customers to cheaper rivals. BA's premium passenger numbers fell 13 percent in the second half of last year, in line with the industry average. Total traffic fell 3.4 percent and while BA carried 33.1 million passengers in last year, a drop of 4.3 percent on the previous year. The dip in demand for British Airways flights has forced a switch in strategy at the premium airline from yields to volume. From the end of last year, it's been tempting passengers with lower fares, sacrificing profit per seat for "bums on seats." "We're now saying it's getting that balance between yield and volume so it's more a focus on volume than it has been," Walsh said. He said the airline would target market share, "where we believe that it is sustainable in the long term and will be profitable." It plans to reduce capacity by four percent next winter by parking up to 16 aircraft. Walsh said the tough trading conditions hadn't killed off its plans for a merger with Spanish airline Iberia. He said the main barrier to the deal was corporate governance. "It's getting the corporate governance for the combined single entity right -- that's a critical issue as far as I'm concerned." "Iberia do have some concerns about our pension deficit. We are very happy to listen to those concerns and I'm also very confident that we can address that," Walsh said. Watch Quest Means Business for the definitive word on how we earn and spend our money, week nights at 1900 London, 2000 CET, 0300 HK.